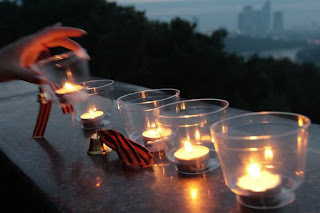 Millions of candles were lit in different regions of Russia at dawn on Sunday to pay tribute to those who died during World War Two. June 22 is the most tragic day in Russian history. 68 years ago, on a warm and quiet morning like today, Nazi Germany invaded the Soviet Union without warning and a terrible and bloody war began. It took the lives of more than 26 million Soviet people. Today we are very unlikely to find anybody who survived the very first battles on the morning of June 22, 1941, Neither will we be able to talk to those who defended their native land against the invaders. However, today`s youth will always remember the victims of the most deadly war. "In June of 1941 I wasworking in a summer camp of young pioneers in a distant Siberian village. Early in the morning on June 22 a man from a local military enlistment office came and told us to leave the camp because the mobilized men would arrive there soon before going to the frontline. At first, we did not take the news seriously. We were told we would fight outside our homeland but everything happened differently. I fought for three years then. This is how the war came to my life. The day of 22d of June is impossible to forget. It changed the lives of hundreds of millions of Soviet people. And while I have enough strength I tell about the horrors of the war to my grandchildren and their friends for they should know and remember this. Thousands of young Russians who on Sunday morning came to the war memorials and lit the candles remember the heroes of WW II.